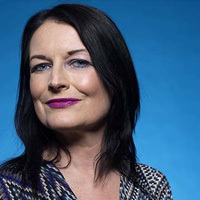 Ghislaine Boddington is a Co-founder of Women Shift Digital and Creative Director of creative design collective body>data>space. With a background in performing arts and technologies she has, across 25 years, converged her innovation knowledge between business, creative industries, education and culture sectors, consulting and directing projects with clients worldwide. Awarded the IX Immersion Experience Visionary Pioneer Award 2017, Ghislaine has keynoted and presented in over 30 countries, is a Reader in Digital immersion at University of Greenwich, and co-presents bi-weekly for BBC Click, the BBC World Service Radio flagship technology show. She has always engaged in her work with a passion for equality and diversity, believing this is the route to real innovation and change in the world. In particular she has focused on women in creative and social tech, exploring the opportunities raised through the merging of value and values, supporting sustainable businesses that have social impact into particular communities and consequently into the wider global scenario. This has led her to work closely as Advisor for the Stemettes and with Tech London Advocates Women in Tech working group.